The five tonne worker in 19th century workers clothing stands arms outstretched and has been created with the help of Brownhills people as part of a campaign to improve key routes into the borough. The sculpture commemorates the miners who worked in the town across the three centuries before the last Brownhills pit closed. Councillor Alan Paul, Brownhills Local Neighbourhood Partnership chairman, said that residents had had a major say in the scheme. It’s a key aim to build pride and by celebrating the rich heritage we have we are doing just that. 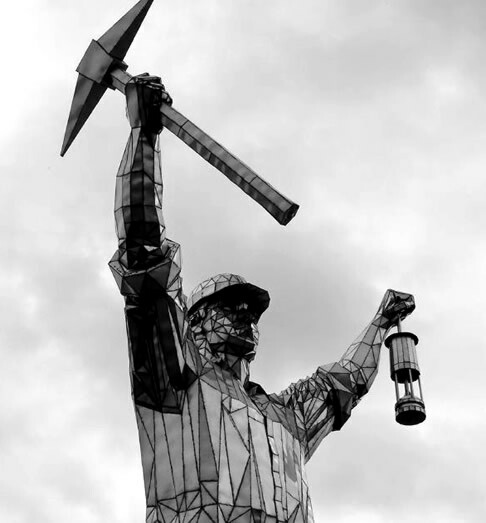 The Brownhills Miner. Photo by John Williams. Jon asks if the £70,000 cost of this sculpture is not worth spending on more deserving public services. Firstly, yes £70,000 could be spent on other more deserving public services, but you know, as publicly commissioned sculptures go, this is cheap at half the price! When things like this usually turn up on roundabouts, they tend to have cost several million pounds (which I would agree is too much) and tend to be pretty meaningless too—ever driven along the Black Country Route? £70,000 seems like a fair price given it’s scale, and associated construction costs. Let’s not forget too that this is also part of a far bigger regeneration plan in the town. New homes, a new Library and Health centre (renovating a local historic building in the process), alongside many other improvements are taking place also. Brownhills hardly has a great reputation, be it crime, drugs or teenage pregnancies. Now I don’t know exact figures, or how true that statement actually is, but that is certainly what I think of and I’m sure other people imagine when they hear the name. This statue not only helps restore local pride, but is is a way of generating interest in the town, be it via local news, word of mouth etc., and get people noticing Brownhills for more positive reasons. With that they will also find out about these other improvements and hopefully see that the town is turning a corner. It’s been a long time coming.